Hiya guys! 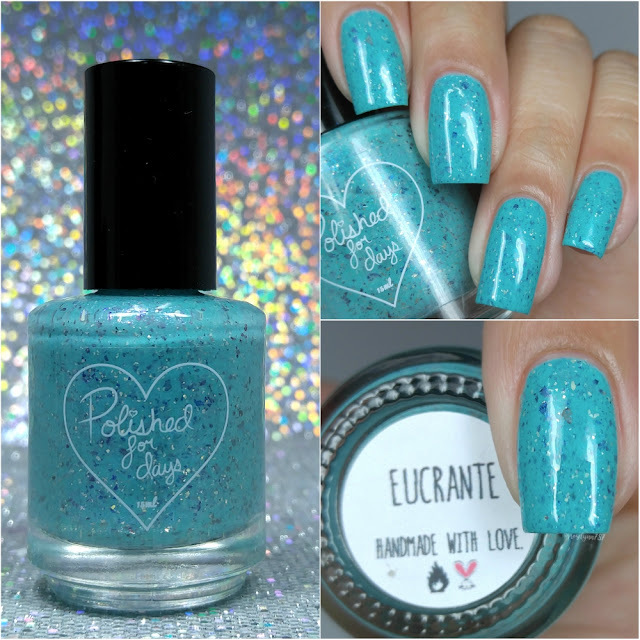 Today I'm sharing swatches for Eucrante, which is part of the Sea Nymphs Collection by Polished For Days. This shade was initially released late last summer and I managed to buy it during Black Friday. I can't believe I have been sitting on such a treasure all these months! It's been a long time since I have been able to swatch my own purchases, so it's something I am going to be doing more often. Maybe I'll actually make a dent in my polish untried pile someday, haha. Anyway, let's get to the swatches! Eucrante and the entire Sea Nymphs Collection by Polished For Days is still available for purchase. Each full-size shade retails for $11.00 or the entire collection can be purchased for $66. Eucrante can be described as a bright turquoise base with a pink-blue shimmer, sterling silver flakes, and navy-teal-violet shifting flakes. The shade is named after the sea nymph (goddess) Eucrante, which was responsible for successful voyages or fishing. The formula has an opaque application, but not quite enough to be a one coater. I was beyond surprised at the perfect consistency this had, not too thick or too thin. I've become accustomed to a bit thicker consistencies when it comes to crelly finishes (especially when you take into consideration glitters/flakies), but this was a smooth as a plain cream. So impressive! It dries to a very minimal gritty finish and smooths out after a layer of topcoat. Shown in two coats and sealed with a glossy topcoat. Overall I'm head over heels with this shade! This was actually my first time purchasing from Polished For Days and it has single-handedly made me a huge fan of this brand. The crelly formula is absolutely fantastic, smooth, and easy to apply. I'm hoping the formula is the same when I go back and purchase the rest of the collection. To recap, Eucrante and the entire Sea Nymphs Collection by Polished For Days is still available for purchase. Each full-size shade retails for $11.00 or the entire collection can be purchased for $66. Have you guys tried out this brand before? If so, what's your favorite shade? This such a beautiful polish! Loooove this! The navy flakes amp this polish up. I love the darker flakes against the turquoise base. This is stunning! Your nails are always so flawless. Gorgeous swatches! I have this one in my stash somewhere, also untried. I love how the navy flakies pop against the bright blue background. Wow, super gorgeous...makes me want to go walk on the beach. Oh wow, this is a gorgeous polish!